Hulk is a hero in the Marvel comic and film universes. Hulk consistently is considered to be in the top 5 most popular Marvel heroes. 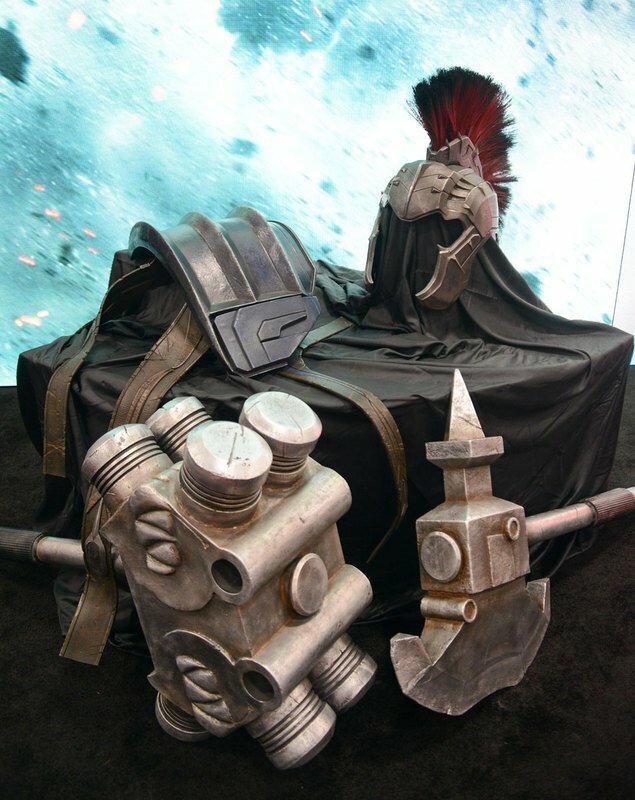 He has appeared in a wide array of TV shows, Video Games, and Movies. Other Hulks: There have been other people who have become Hulk or different versions of Hulk such as Gray Hulk, Red Hulk and Totally Awesome Hulk. Bruce Banner remains the primary person thought of as Hulk. Hulk is famous for the line: "Hulk Smash"
Toylab has gone through and found the coolest Hulk merchandise on Amazon and set the links up right below so you can find Hulk toys and merchandise with a single click. The links below go directly to Amazon and not to any third party. The brilliant Dr. Bruce Banner is exposed to gamma radiation from a bomb of his own making. He entered the blast radius in order to save a teenager who had driven inside. Banner shields the teenager with his own body absorbing a massive amount of gamma radiation. Waking later in a hospitable Banner is surprised to find that he is alive with only minor injuries. Later that same night Banner learns that his body has indeed mutated. He transforms into a huge, gray skinned humanoid. A soldier seeing Banner remarks that he saw a "Hulk!" giving him his name. Hulk goes through a variety of changes over the years. Initially, Hulk's powers overcome Banner at night and he reverts to human form during the day (Like a werewolf). Banner cures himself of this but then requires the Hulks powers again so he builds a machine to recreate the Gamma exposure. The Hulk initially is shown speaking in full sentences and is colored gray as oppose to his more common green color. Overtime, the Hulk personality becomes less intelligent, and more childlike. It is later shown that trauma suffered during Banner's childhood help fuel the rage that burns inside the Hulk. An ongoing story line is that the United States military is pursing the Hulk to exploit his biology to build super soldiers and also to prevent him from doing more damage. To make the US military's pursuit of him even worse a General who is competing with Banner for the heart of Betty Ross sees him transform into the Hulk. This makes Banner a fugitive. For a time Hulk is shown as having multiple personalities each with its own color. These end up united to form one united Hulk when Banner confronts the abuse he suffered as a child. Hulk confronts an evil version of himself named Maestro who rules over a universe where many heroes are dead. Hulk is one of the founding members of the Avengers. His childlike behavior can make him dangerous to have on the team, but his insane power has at times been required to defeat powerful world threatening villains. A group of the most intelligent and powerful heroes called the Illuminati decide that Hulk is too dangerous to keep on Earth and blast him into space. He lands on the planet Sakaar where he has a variety of adventures that lead him to being King of the planet. His new wife is killed when the Illuminati ship explodes. Believing this was the work of the Illuminati Hulk sets off to Earth with a large of army of aliens called the Warbound to seek revenge. With nearly unlimited strength at his disposal from the rage at losing his wife, Hulk is unstoppable as he crushes nearly every hero on Earth. He enslaves many of the heroes and brings them to a Colosseum for them to battle each other. Before he kills anyone though he learns that the Illuminati are not responsible for the ship explosion and he grudgingly gives up his quest for revenge. 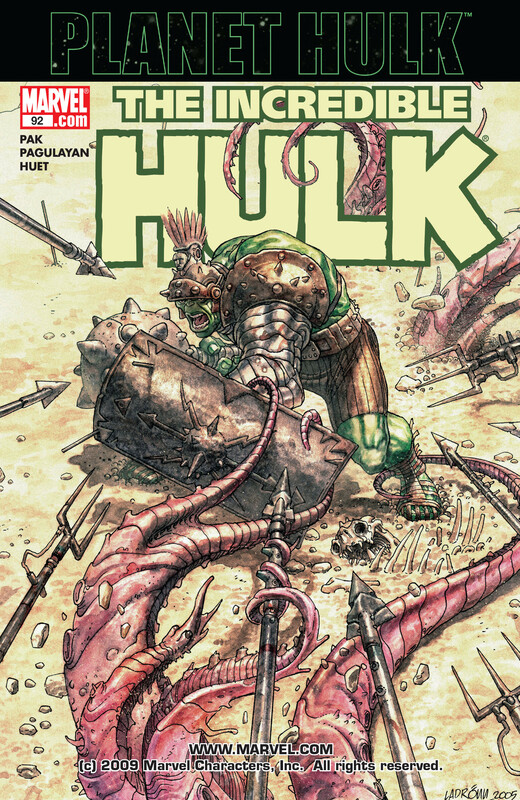 The Axis storyline features a ruthless new Hulk that stems from a buried personality of the Hulk itself taking control. This personality is called Kluh and is extremely violent and morally ambivalent. Amadeus Cho gains the powers of Hulk but maintains his intelligence. He then takes on the role of Totally Awesome Hulk. 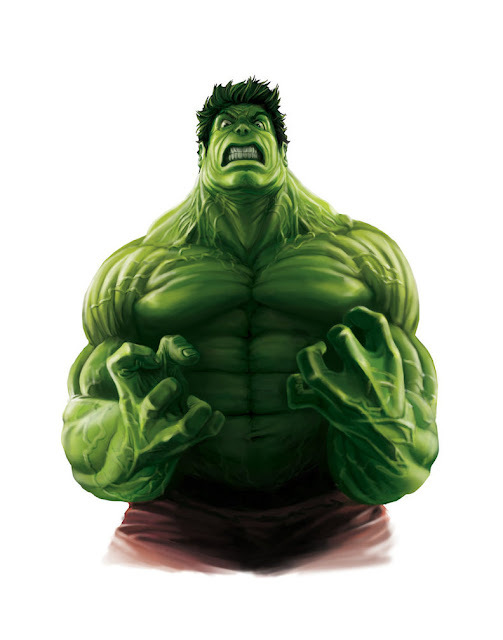 The Hulk has limitless strength that can grow depending on his anger level. The more angrier he becomes the greater his strength. This means that the strength level of Hulk is effectively infinite as he can always get more angry. While he can start out at a lower strength level of an opponent his heat can rachet up and go beyond them. The Hulk's body also heals extremely quickly, is highly durable, and fast. He is capable of jumping long distances to the point where it appears he is almost flying. He also has been shown to have some unclear mental capabilities. He is able to hone and locate the place in New Mexico where he was created. The Hulk is also shown as being highly resistant to psychic attack. Bruce Banner is played by Edward Norton. In this film Banner is on the run from the government. He must battle a deranged soldier turned into a gamma radiated monster created by the US Government. Bruce Banner is played by Mark Ruffalo who will reprise the role in Avengers: Age of Ultron. Avengers: SHIELD seeks out Bruce Banner for him to join a special team of super heroes called the Avengers. Loki seeks to destroy the team by causing Banner to lose control while aboard a SHIELD heli-carrier. The plan back fires as the team unites and defeats an alien invasion set in motion by Loki. The Hulk loses control and goes on a rampage in Africa and is only stopped by the combined by Black Widow getting him to calm down. Barnner struggles with guilt over the damage done by the Hulk. After the defeat of Ultron Banner flies away on a SHIELD aircraft for an unknown location. Banner refuses to uncloak the vessel despite the pleas of the Black Widow and the other Avengers. Hulk will appear alongside Thor in Thor Ragnarok. It is expected that some aspects of the Thor comic series Planet Hulk will carry over to the film. 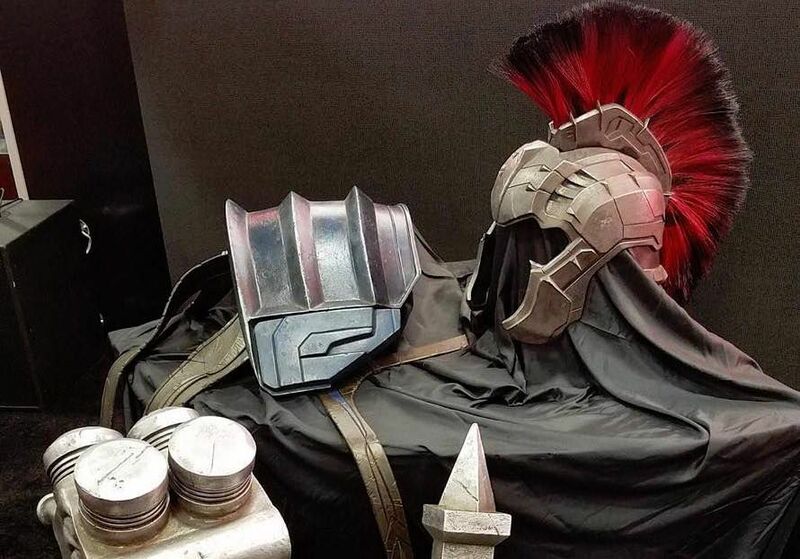 The helmet looks exactly like the one worn by Hulk when he fights in the arena on Sakaar in the Planet Hulk story. Lovely blog page design . Thank you for the nice post .